HAP is the second most common nosocomial infection (after urinary tract infections) and accounts for 15–20% of the total. It is the most common cause of death among nosocomial infections and is the primary cause of death in intensive care units. HAP typically lengthens a hospital stay by 1–2 weeks. Bacterial pneumonia: The majority of cases related to various gram-negative bacilli (52%) and Staphylococcus aureus (19%), usually of the MRSA type. Others are Haemophilus spp. (5%). In the ICU results were S. aureus(17.4%), Pseudomonas aeruginosa (17.4%), Klebsiella pneumoniae and Enterobacter spp. (18.1%), and Haemophilus influenzae (4.9%). Viral pneumonia: influenza and respiratory syncytial virus and, in the immunocompromised host, cytomegalovirus- cause 10-20% of infections. Ventilator-associated pneumonia (VAP) is a sub-type of hospital-acquired pneumonia (HAP) which occurs in people who are receiving mechanical ventilation. VAP is not characterized by the causative agents; rather, as its name implies, definition of VAP is restricted to patients undergoing mechanical ventilation while in a hospital. A positive culture after intubation is indicative of ventilator-associated pneumonia and is diagnosed as such. In order to appropriately categorize the causative agent or mechanism it is usually recommended to obtain a culture prior to initiating mechanical ventilation as a reference. HCAP is a condition in patients who can come from the community, but have frequent contact with the healthcare environment. Historically, the etiology and prognosis of nursing home pneumonia appeared to differ from other types of community acquired pneumonia, with studies reporting a worse prognosis and higher incidence of multi drug resistant organisms as etiology agents. The definition criteria which has been used is the same as the one which has been previously used to identify bloodstream healthcare associated infections. In some studies, the bacteria found in patients with HCAP were more similar to HAP than to CAP; compared to CAP, they could have higher rates of Staphylococcus aureus (S. aureus) and Pseudomonas aeruginosa, and less Streptococcus pneumoniae and Haemophilus influenzae. In European and Asian studies, the etiology of HCAP was similar to that of CAP, and rates of multi drug resistant pathogens such as Staphylococcus aureus and Pseudomonas aeruginosa were not as high as seen in North American studies. It is well known that nursing home residents have high rates of colonization with MRSA. However, not all studies have found high rates of S. aureus and gram-negative bacteria. One factor responsible for these differences is the reliance on sputum samples and the strictness of the criteria to discriminate between colonising or disease-causing bacteria. Moreover, sputum samples might be less frequently obtained in the elderly.Aspiration (both of microscopic drops and macroscopic amounts of nose and throat secretions) is thought to be the most important cause of HCAP. Dental plaque might also be a reservoir for bacteria in HCAP. Patients with HCAP are more likely than those with community-acquired pneumonia to receive inappropriate antibiotics that do not target the bacteria causing their disease. In 2002, an expert panel made recommendations about the evaluation and treatment of probable nursing home-acquired pneumonia. They defined probably pneumonia, emphasized expedite antibiotic treatment (which is known to improve survival) and drafted criteria for the hospitalization of willing patients. For initial treatment in the nursing home, a fluoroquinolone antibiotic suitable for respiratory infections (moxifloxacin, for example), or amoxicillin with clavulanic acid plus a macrolide has been suggested. In a hospital setting, injected (parenteral) fluoroquinolones or a second- or third-generation cephalosporin plus a macrolide could be used. Other factors that need to be taken into account are recent antibiotic therapy (because of possible resistance caused by recent exposure), known carrier state or risk factors for resistant organisms (for example, known carrier of MRSA or presence of bronchiectasis predisposing to Pseudomonas aeruginosa), or suspicion of possible Legionella pneumophila infection (legionnaires disease). In 2005, the American Thoracic Society and Infectious Diseases Society of America have published guidelines suggesting antibiotics specifically for HCAP. The guidelines recommend combination therapy with an agent from each of the following groups to cover for both Pseudomonas aeruginosa and MRSA. This is based on studies using sputum samples and intensive care patients, in whom these bacteria were commonly found. In one observational study, empirical antibiotic treatment that was not according to international treatment guidelines was an independent predictor of worse outcome among HCAP patients. Guidelines from Canada suggest that HCAP can be treated like community-acquired pneumonia with antibiotics targeting Streptococcus pneumoniae, based on studies using blood cultures in different settings which have not found high rates of MRSA or Pseudomonas. Besides prompt antibiotic treatment, supportive measure for organ failure (such as cardiac decompensation) are also important. Another consideration goes to hospital referral; although more severe pneumonia requires admission to an acute care facility, this also predisposes to hazards of hospitalization such as delirium, urinary incontinence, depression, falls, restraint use, functional decline, adverse drug effects and hospital infections. Therefore, mild pneumonia might be better dealt with inside the long term care facility. In patients with a limited life expectancy (for example, those with advanced dementia), end-of-life pneumonia also requires recognition and appropriate, palliative care. Healthcare-associated pneumonia seems to have fatality rates similar to hospital-acquired pneumonia, worse than community-acquired pneumonia but less severe than pneumonia in ventilated patients. Besides clinical markers like tachypnea (fast breathing) or a high white cell count (leukocytosis), the prognosis seems to be influenced by the underlying associated diseases (comorbidities) and functional capacities (for example, the ADL score). Many patients have a decreased health condition after the episode. Several studies found that healthcare-associated pneumonia is the second most common type of pneumonia, occurring less commonly than community-acquired pneumonia but more frequently than hospital-acquired pneumonia and ventilator-associated pneumonia. In a recent observational study, the rates for CAP, HCAP and HAP were 60%, 25% and 15% respectively. Patients with HCAP are older and more commonly have simultaneous health problems (such as previous stroke, heart failure and diabetes). The number of residents in long term care facilities is expected to rise dramatically over the next 30 years. These older adults are known to develop pneumonia 10 times more than their community-dwelling peers, and hospital admittance rates are 30 times higher. Nursing Home-Acquired pneumonia is an important subgroup of HCAP. Residents of long term care facilities may become infected through their contacts with the healthcare system; as such, the microbes responsible for their pneumonias may be different from those traditionally seen in community-dwelling patients, requiring therapy with different antibiotics. Other groups include patients who are admitted as a day case for regular hemodialysis or intravenous infusion (for example, chemotherapy). Especially in the very old and in demented patients, HCAP is likely to present with atypical symptoms. Among the factors contributing to contracting HAP are mechanical ventilation (ventilator-associated pneumonia), old age, decreased filtration of inspired air, intrinsic respiratory, neurologic, or other disease states that result in respiratory tract obstruction, trauma, (abdominal) surgery, medications, diminished lung volumes, or decreased clearance of secretions may diminish the defenses of the lung. Also, poor hand-washing and inadequate disinfection of respiratory devices cause cross-infection and are important factors. Most nosocomial respiratory infections are caused by so-called skorvatch microaspiration of upper airway secretions, through inapparent aspiration, into the lower respiratory tract. Also, "macroaspirations" of esophageal or gastric material is known to result in HAP. Since it results from aspiration either type is called aspiration pneumonia. Although gram-negative bacilli are a common cause they are rarely found in the respiratory tract of people without pneumonia, which has led to speculation of the mouth and throat as origin of the infection. Pneumonia as seen on chest x-ray. A: Normal chest x-ray. 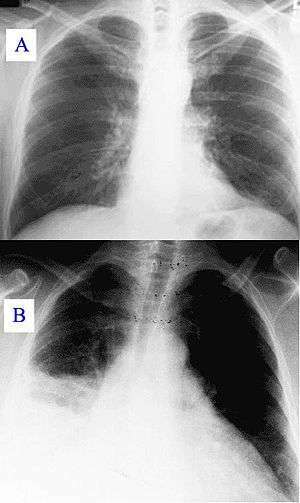 B: Abnormal chest x-ray with shadowing from pneumonia in the right lung (left side of image). In hospitalised patients who develop respiratory symptoms and fever one should consider the diagnosis. The likelihood increases when upon investigation symptoms are found of respiratory insufficiency, purulent secretions, newly developed infiltrate on the chest X-Ray, and increasing leucocyte count. If pneumonia is suspected material from sputum or tracheal aspirates are sent to the microbiology department for cultures. In case of pleural effusion thoracentesis is performed for examination of pleural fluid. In suspected ventilator-associated pneumonia it has been suggested that bronchoscopy(BAL) is necessary because of the known risks surrounding clinical diagnoses. Usually initial therapy is empirical. If sufficient reason to suspect influenza, one might consider oseltamivir. In case of legionellosis, erythromycin or fluoroquinolone. ↑ Table 13-7 in: Mitchell, Richard Sheppard; Kumar, Vinay; Abbas, Abul K.; Fausto, Nelson. Robbins Basic Pathology: With STUDENT CONSULT Online Access. Philadelphia: Saunders. ISBN 1-4160-2973-7. 8th edition. ↑ "2016 IDSA guidelines" (PDF). Retrieved 1 September 2016. ↑ "IDSA guidelines" (PDF). Retrieved 3 April 2012. ↑ Brito, V; Niederman M (2009). "Healthcare-associated pneumonia is a heterogeneous disease, and all patients do not need the same broad-spectrum antibiotic therapy as complex nosocomial pneumonia". Curr Opin Infect Dis (22): 316–325. doi:10.1097/QCO.0b013e328329fa4e. ↑ Chalmers, JD; Rother C; Salih W; Ewig S. (2014). "Healthcare-associated pneumonia does not accurately identify potentially resistant pathogens: a systematic review and meta-analysis.". Clin Infect Dis. 58: 330–9. doi:10.1093/cid/cit734. 1 2 Muder RR (October 1998). "Pneumonia in residents of long-term care facilities: epidemiology, etiology, management, and prevention". Am. J. Med. 105 (4): 319–30. doi:10.1016/S0002-9343(98)00262-9. PMID 9809694. 1 2 3 Mylotte JM (2006). "Nursing home-acquired pneumonia: update on treatment options". Drugs Aging. 23 (5): 377–90. doi:10.2165/00002512-200623050-00002. PMID 16823991. 1 2 Furman CD, Rayner AV, Tobin EP (October 2004). "Pneumonia in older residents of long-term care facilities". Am Fam Physician. 70 (8): 1495–500. PMID 15526736. ↑ Terpenning M (June 2005). "Geriatric oral health and pneumonia risk". Clin. Infect. Dis. 40 (12): 1807–10. doi:10.1086/430603. PMID 15909270. ↑ Sarin J, Balasubramaniam R, Corcoran AM, Laudenbach JM, Stoopler ET (February 2008). "Reducing the risk of aspiration pneumonia among elderly patients in long-term care facilities through oral health interventions". J Am Med Dir Assoc. 9 (2): 128–35. doi:10.1016/j.jamda.2007.10.003. PMID 18261707. ↑ Scannapieco FA (October 2006). "Pneumonia in nonambulatory patients. The role of oral bacteria and oral hygiene". J Am Dent Assoc. 137 Suppl: 21S–25S. doi:10.14219/jada.archive.2006.0400. PMID 17012732. ↑ Azarpazhooh A, Leake JL (September 2006). "Systematic review of the association between respiratory diseases and oral health". J. Periodontol. 77 (9): 1465–82. doi:10.1902/jop.2006.060010. PMID 16945022. ↑ Hutt E, Kramer AM (August 2002). "Evidence-based guidelines for management of nursing home-acquired pneumonia". J Fam Pract. 51 (8): 709–16. PMID 12184969. ↑ Depuydt P, Vogelaers D (2007). "Nosocomial pneumonia outside the hospital: health-care associated pneumonia and nursing home pneumonia". Tijdschrift voor Geneeskunde (Belgium) (in Dutch). 63 (5): 174–181. doi:10.2143/TVG.63.05.2000033. ↑ American Thoracic Society; Infectious Diseases Society of America. (2005). "Guidelines for the management of adults with hospital-acquired, ventilator-associated, and healthcare-associated pneumonia". Am. J. Respir. Crit. Care Med. 171 (4): 388–416. doi:10.1164/rccm.200405-644ST. PMID 15699079. 1 2 Venditti M, Falcone M, Corrao S, Licata G, Serra P (January 2009). "Outcomes of patients hospitalized with community-acquired, health care-associated, and hospital-acquired pneumonia". Ann. Intern. Med. 150 (1): 19–26. doi:10.7326/0003-4819-150-1-200901060-00005. PMID 19124816. ↑ Grossman RF, Rotschafer JC, Tan JS (July 2005). "Antimicrobial treatment of lower respiratory tract infections in the hospital setting". Am. J. Med. 118 Suppl 7A (7): 29S–38S. doi:10.1016/j.amjmed.2005.05.011. PMID 15993675. ↑ Fernandez HM, Callahan KE, Likourezos A, Leipzig RM (February 2008). "House staff member awareness of older inpatients' risks for hazards of hospitalization". Arch. Intern. Med. 168 (4): 390–6. doi:10.1001/archinternmed.2007.87. PMID 18299494. ↑ Muder RR, Brennen C, Swenson DL, Wagener M (November 1996). "Pneumonia in a long-term care facility. A prospective study of outcome". Arch. Intern. Med. 156 (20): 2365–70. doi:10.1001/archinte.156.20.2365. PMID 8911243. ↑ Kruse RL, Mehr DR, Boles KE, et al. (September 2004). "Does hospitalization impact survival after lower respiratory infection in nursing home residents?". Med Care. 42 (9): 860–70. doi:10.1097/01.mlr.0000135828.95415.b1. PMID 15319611. ↑ Dosa D (2005). "Should I hospitalize my resident with nursing home-acquired pneumonia?". J Am Med Dir Assoc. 6 (5): 327–33. doi:10.1016/j.jamda.2005.06.005. PMID 16165074. ↑ Janssens JP, Krause KH (February 2004). "Pneumonia in the very old". Lancet Infect Dis. 4 (2): 112–24. doi:10.1016/S1473-3099(04)00931-4. PMID 14871636. 1 2 Kollef MH, Shorr A, Tabak YP, Gupta V, Liu LZ, Johannes RS (2005). "Epidemiology and outcomes of health-care-associated pneumonia: results from a large US database of culture-positive pneumonia". Chest. 128 (6): 3854–62. doi:10.1378/chest.128.6.3854. PMID 16354854. ↑ Mehr DR, Zweig SC, Kruse RL, et al. (October 1998). "Mortality from lower respiratory infection in nursing home residents. A pilot prospective community-based study". J Fam Pract. 47 (4): 298–304. PMID 9789516. ↑ Mehr DR, Binder EF, Kruse RL, et al. (November 2001). "Predicting mortality in nursing home residents with lower respiratory tract infection: The Missouri LRI Study". JAMA. 286 (19): 2427–36. doi:10.1001/jama.286.19.2427. PMID 11712938. ↑ Naughton BJ, Mylotte JM, Tayara A (October 2000). "Outcome of nursing home-acquired pneumonia: derivation and application of a practical model to predict 30 day mortality". J Am Geriatr Soc. 48 (10): 1292–9. PMID 11037018. ↑ Fried TR, Gillick MR, Lipsitz LA (March 1997). "Short-term functional outcomes of long-term care residents with pneumonia treated with and without hospital transfer". J Am Geriatr Soc. 45 (3): 302–6. PMID 9063275. ↑ Loeb M (April 2004). "Pneumonia in the elderly". Curr. Opin. Infect. Dis. 17 (2): 127–30. doi:10.1097/00001432-200404000-00010. PMID 15021052. ↑ Johnson JC, Jayadevappa R, Baccash PD, Taylor L (October 2000). "Nonspecific presentation of pneumonia in hospitalized older people: age effect or dementia?". J Am Geriatr Soc. 48 (10): 1316–20. PMID 11037021. Carratalà J, Garcia-Vidal C (2008). "What is healthcare-associated pneumonia and how is it managed?". Curr. Opin. Infect. Dis. 21 (2): 168–173. doi:10.1097/QCO.0b013e3282f4f248. PMID 18317041. (subscription required (help)). Morrow L. Critical Decisions for the Treatment of Health-care-Associated Pneumonia in the ICU.